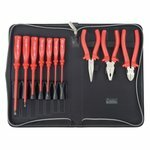 A set of insulated tools (11 pcs.) in zipper bag including screwdrivers and pliers for various applications. 8 Piece Set. 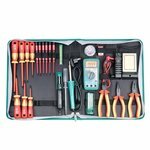 This tool kit is essential for working with hi-voltage electrical items. Supplied in an zipped tool bag. 24 pcs. tools for high-voltage elements maintenance (1000V). Case size: 382x283x60 mm. 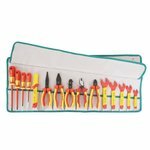 A set of insulated tools (26 pcs.) 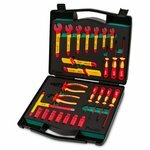 in a durable tool box including wrenches, screwdrivers and pliers for various applications. 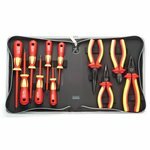 A set of insulated tools (15 pcs.) 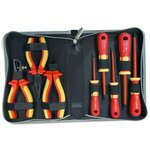 in a convenient tool roll bag including wrenches, screwdrivers and pliers for various applications.